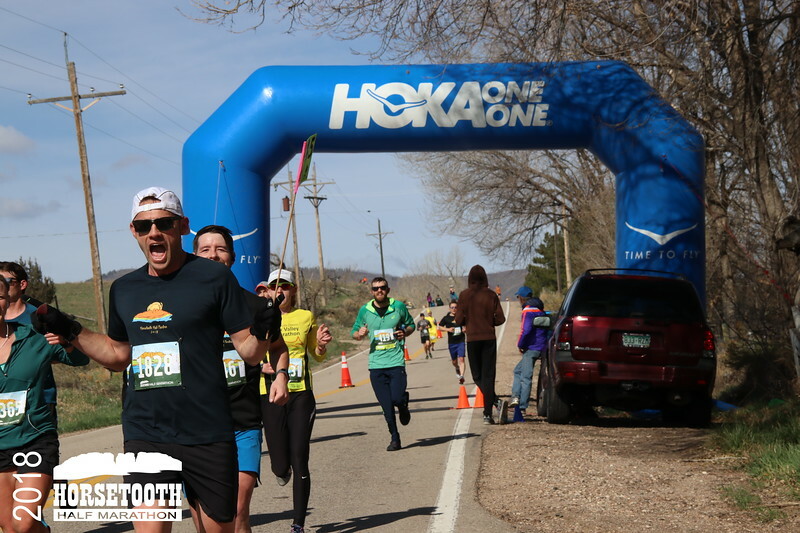 The Horetooth Half Marathon will again be awarding $8,000 in prize money this year, with generous support from the Fort Collins Running Club. Overall awards for the 45th running of the event will go five deep. In the master’s division, payouts will go three deep, and – once again – there will be a separate Fort Collins Running Club-only pool. In addition, the race will be awarding a $200 premium to the first man and first woman to the top of Monster Mountain at mile 1.8, some 500 feet above the race start on Dixon Canyon Drive. “The Fort Collins Running Club is committed to supporting runners of all ages, talent, and experience. As part of our mission to support the elite side of the sport in Colorado, the Club has continued its support of the Horsetooth Half prize purse by matching the $4,000 put up by the race, as well as increasing our support of local runners by offering cash awards for our top club members,” said Fort Collins Running Club Board Member, Kate Schulte. For full award details, including age group awards, please visit the awards section of the race website. There will be a new champion this year, with 2018 champion Brandon Johnson currently working his way back from injury. That leaves the field wide open. The top returning runner from last year is University of Wyoming Assistant Cross Country Coach, Scott Dahlberg, who finished fourth in 2018 in a quick 1:09:51 after finishing third in 2017 (1:09:21). An interesting addition to the field this year is Poudre High & Colorado State standout Grant Fischer, who continues to train post-collegiately with the Siemers Dreamers group. 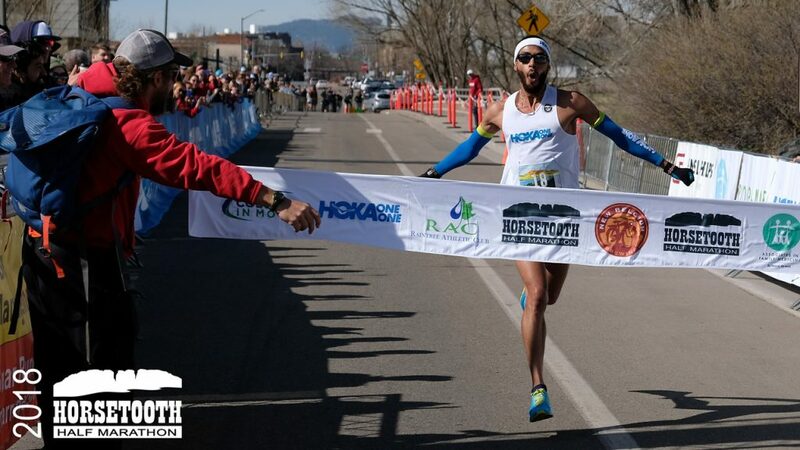 He’ll be stepping up in distance to the half marathon for the first time at the Horsetooth Half, abd comes into the race with 5k/10k PRs of 13:44 & 28:45. Both Scott and Grant will be pushed by a long list of other elite entrants that will be in the hunt for a podium finish. These include Dominic Korir, a Colorado Springs-based Kenyan training with the American Distance Project. Korir appears to be in great form, running a 1:02:59 for second in December at the San Diego Holiday Half. Boulder’s Kurt Roeser will also be toeing the line eyeing a podium finish on Sunday after running his way into the 2020 Olympic Trials (Marathon) at the California International Marathon in December with a 2:17:55. 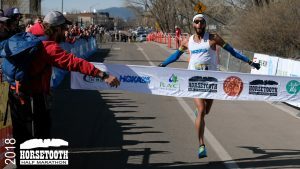 Finishing fifth in 2018, Alejandro Garcia is showing some recent form, coming off a win at the 2019 Spring Equinox Half Marathon (1:10:57) here in Fort Collins. Second and third place finishers from that same race, Brian Eimstad and Alexander Mauro, will also be toeing the line on Sunday. Bashash Walio was seventh last year and will be back on the start line after running a 1:05 at the Bryce Canyon Half last summer. He too has had success at the Equinox races winning the 2017 Fall Equinox Half Marathon. 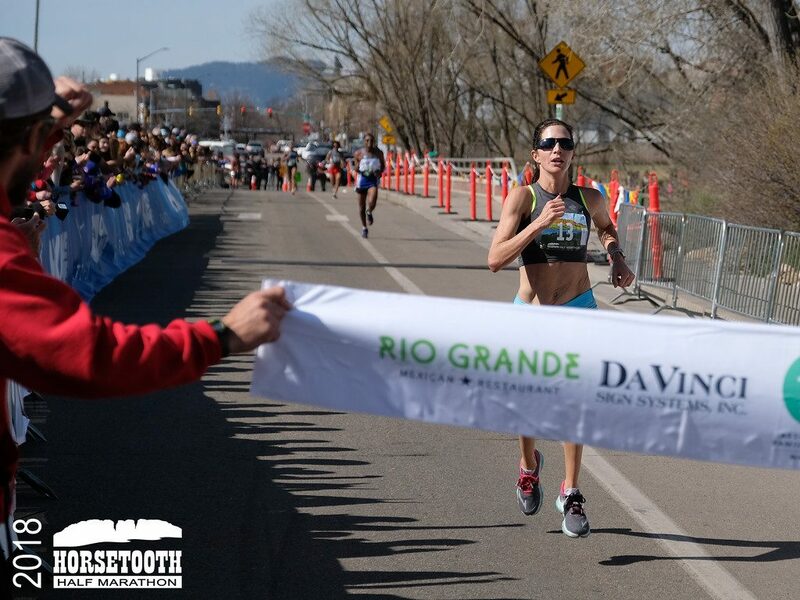 AnnMarie Kirkpatrick will be headlining the women’s field at the 46th running of the Horsetooth Half on Sunday. And she has been in great form since last year’s win, scoring a big PR at the Cal International Marathon (2:37:49) in December. Her run last year was the second fastest ever in the 45 year history of the race, but she’ll likely have to go quicker this year to defend her title. AnnMarie is going to be pushed hard by a very strong field, led by Boulder-based Kenyan Grace Kahura who had a breakout race in June of last year, running a 2:34:02 at Grandma’s Marathon in MN. She followed that up with a 1:14:20 half in Columbus, OH. Countrywomen, Ivy Kibet, based in Colorado Springs is also likely to be in the mix after running a PR 1:13:26 in Santa Fe in September. Westminster’s Ashley Brasovan does a bit of everything. Last year alone she won a number of trail and mountain races, including a third fastest ever at the Mount Evans Ascent, while also staying sharp on the roads with an 11th place finish at the US Road Half Marathon Championships. With 1:14 and 2:40 half and full PRs, she too will be in the mix on Sunday. Nicole Feest was a CSU standout over a decade ago, before pursuing a post-collegiate career with Brad Hudson in Boulder. She ran a 2:41 marathon PR in 2013 to qualify for the 2016 Olympic Trials, then took a couple years off. Now training under Kathy Butler, she is using the Horsetooth Half as her comeback race. Both Laura Cook and Adrian Neal punched their tickets to the 2020 Olympic Marathon Trials in December with runs of 2:43 and 2:44 respectively. Both of the Colorado residents will be looking to push for the podium this Sunday. Finishing third in 2016 was Ruth Waller-Liddle. A 800 meter standout at Baylor University, Ruth has been stepping up in distance in recent years and looks ready for another strong run at the Horsetooth Half this year after an eighth place finish last year. One place ahead of Ruth last year was triathlete Uli Broome who will also be back on the start line this year. Others pushing for top spots include Broomfield’s Emily Renner who ran a 2:54 at last year’s Grandma’s Marathon, and Texas A&M miler Sophie Blake who has been stepping up in distance, last year running 1:22 at the Houston Half. 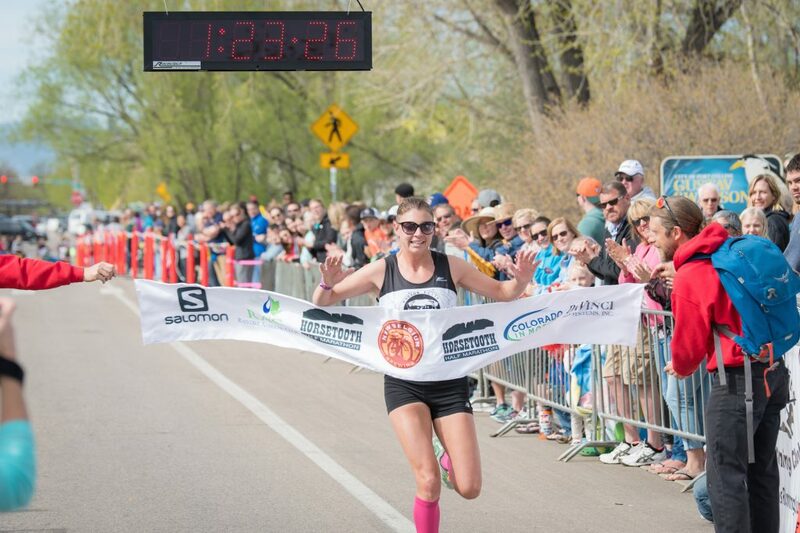 The Horetooth Half Marathon will be awarding a record $8,000 in prize money this year, with generous support from the Fort Collins Running Club. Overall awards for the 45th running of the event will go five deep. In the master’s division, payouts will go three deep, and – new this year – there will be a separate Fort Collins Running Club-only pool. In addition, the race will be awarding a $200 premium to the first man and first woman to the top of Monster Mountain at mile 1.8, some 500 feet above the race start on Dixon Canyon Drive. “The Fort Collins Running Club is committed to supporting runners of all ages, talent, and experience. 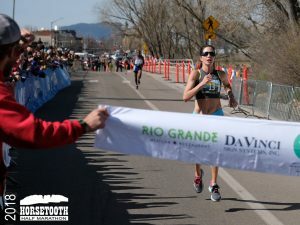 As part of our mission to support the elite side of the sport in Colorado, the Club has added an additional $4,000 to the 2018 Horsetooth Half prize purse, as well as increasing our support of local runners by offering cash awards for our top club members,” said Fort Collins Running Club Co-President, Kate Schulte. Tyler McCandless (right) beats Gebre Abadi and Scott Dahlberg over the hill to win the 2017 King of the Hill prem. In 2017, we saw the top three men all go under the existing course record, with Gebre Abadi setting the new standard at 1:07:27. 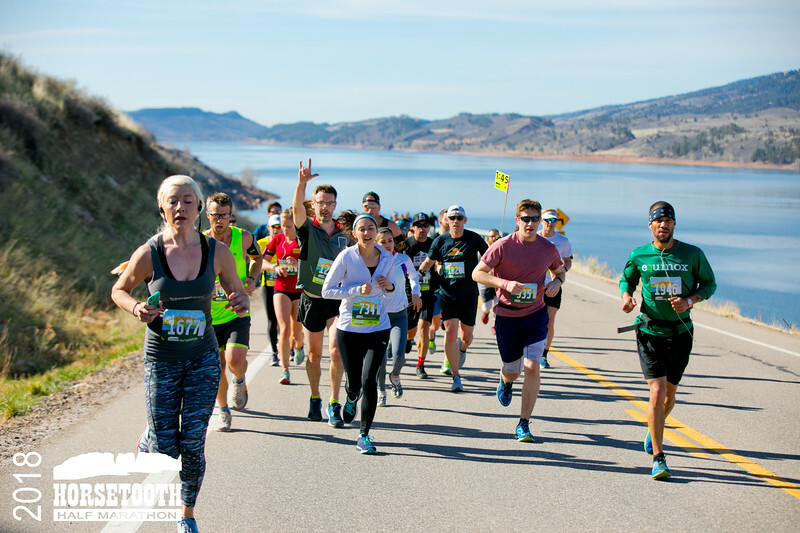 For the 45th running of the Horsetooth Half on April 15, 2018, we’re excited to be welcoming back the full 2017 podium. As the defending champion and course record holder, Gebre Abadi will be wearing the number one bib and he will be the man to beat. Denver-based Abadi looks to be in good form, with a 1:05 win at the January Carlsbad Half Marathon and a quick 14:20 at the Carlsbad 5,000 last month. Perhaps in even better recent form is Tyler McCandless. Second last year in 1:09:16, McCandless has since set a massive marathon PR while finishing second in the USATF Marathon Championships at the California International Marathon in December. His time of 2:12:28 is a true breakthrough performance and puts him among the best U.S. marathoners in the country, and surely suggests he will be in contention at the 2020 Olympic Trials qualifying race (location TBD). University of Wyoming Assistant Track Coach, Scott Dahlberg, was just 8 seconds back of McCandless while finishing third last year. He too will be back to toe the line for the 45th running of the event after winning the Seattle Half Marathon in November. Other elite entrants that will be in the hunt for a podium finish include Brandon Johnson who, like McCandless, had a breakout run at the Cal International Marathon, debuting at the distance with an Olympic Trials qualifying time of 2:18:13. With a 1:05:11 half PR, we expect Brandon to be firmly in the mix. Previous course record holder, Paul Petersen, collects his 2017 age group award. Others showing recent form include Bashash Walio, winner of the 2017 Fall Equinox Half Marathon (1:10:23) here in Fort Collins; Germay Tesfai, winner of the Two Cities Half Marathon in November with recent college (Chico State) PRs of 30:33 (10k) and 14:30 (5k); and Eddie Perez, who ran a 1:09:54 at the USA Half Marathon Invitational in San Diego. Alejandro Garcia was a 2017 DII All American and recently won the Spring Equinox Half Marathon (1:12:01) here in Fort Collins. Known more as a trail and mountain runner, former Pikes Peak Ascent winner (2:12, 2010) Timmy Parr is likely be looking to push the pace for the Monster Mountain premium. 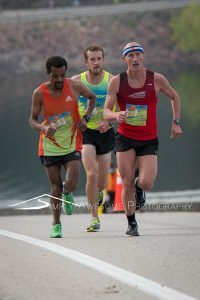 Others in the field with Horsetooth Half form include former course record holder (1:10:32) and multi-time winner (2013 & 2015), Paul Petersen; 2010 winner Steve Folkerts; 8th place finisher in 2017 Chris Copenhaver; and defending Master’s Champ Dan Clark. Maggie Callahan wins the women’s 2017 race. Brianne Nelson reset the record books in 2016 with her amazing 1:16:44 run, which was not only good enough for the women’s win but indeed the overall race win. While we don’t think that Brianne will be taking home overall honors this year, we can’t help but think she’ll be the runner to beat in the women’s race. Brianne Nelson on her way to an overall win in 2016, followed closely by Stephen Pretak in second. However, last year’s winner Maggie Callahan may have a few things to say about that. And Fort Collins was a great venue for Maggie last year. Not only did she win the Horsetooth Half, but she also took home top honors in the inaugural Fortitude 10k Pro Chase and the Fort Collins Running Club’s July 4th FireKracker 5k Elite race. 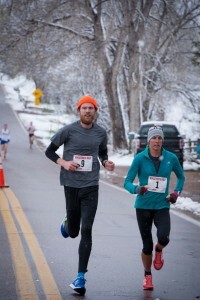 AnnMarie Kirkpatrick has been in great form since here 4th place finish at the Horsetooth Half last year. The highlight of AnneMarie’s 2017 running year was an Olympic Trials Qualifying run at the Cal International Marathon in December (2:44:51). And, with a 1:14:30 finish at the 2018 Houston Half Marathon in January, AnnMarie looks to be ready to go at least one better than her string of two consecutive fourth-place finishes at the Horsetooth Half in 2017 and 2016. Besting AnnMarie for third in 2016 was Ruth Waller-Liddle. A 800 meter standout at Baylor University, Ruth has been stepping up in distance in recent years and looks ready for another strong run at the Horsetooth Half this year. Adriana Nelson (nee Pirtea) has a marathon PR of 2:28 (London, 2008), a half marathon PR of 1:11 (New York, 2013), and finished second at the 2007 Chicago Marathon. In 2013, she won the USATF Half Marathon Championship (1:11) in Duluth. 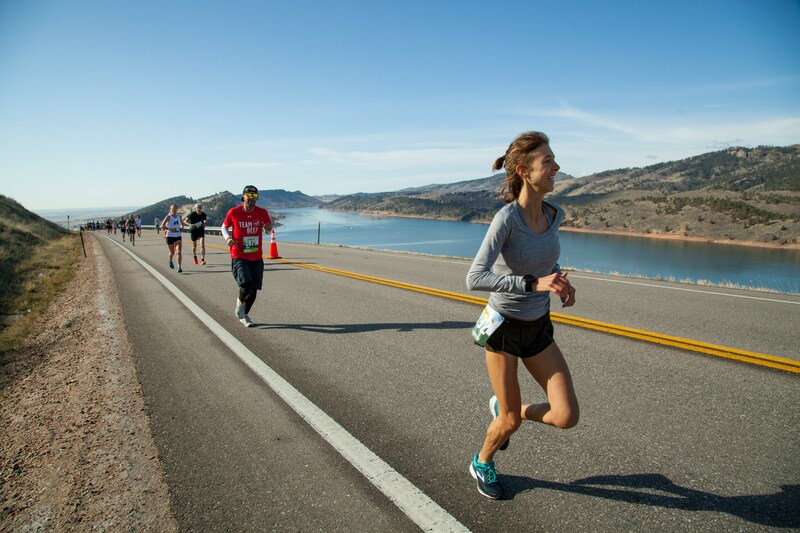 Adriana will be using the Horsetooth Half as her first race back from giving birth to her first child, AJ. She claims a lack of fitness, but all things are relative and we’re just excited to have such a world-class talent in the field. 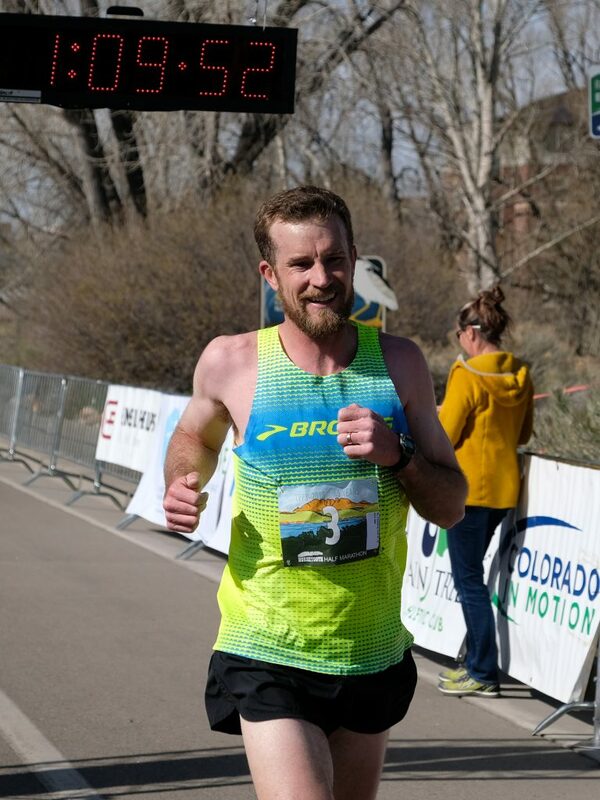 Among those that are newcomers to the Horsetooth Half course are pro triathlete Uli Bromme, who has a marathon PR of 2:47 and a 2017 altitude half marathon win (1:24) at the Three Creeks Half Marathon. Kyle Blakeslee is a 7-Time DII All American and ran a 1:16:24 half marathon PR at the Houston Half Marathon in January. Caroline Veltri is also coming into the race with great recent form, winning the San Antonio Marathon (2:56) in December and running a 1:22 half marathon in Las Vegas in November.